A goat in the garden: GO SOLAR!! One family's adventures in self sufficiency. YAY, we finally have our grid connected solar power system!!! YAY! Here is our beautiful panels, so simple and yet able to generate pretty much all the power we need - the meter was spinning backwards quickly!!! We are very happy - one day all houses will have a solar array, but for now we will have to be content with knowing that at least we are making a contribution. 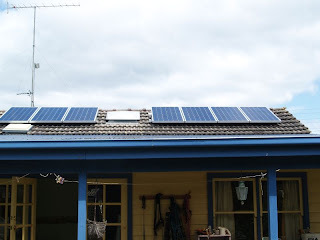 I highly recommend people to look into getting a solar power system for their homes, really with the current rebates available (in Australia - although other countries have much better...) its no greater cost than a new car or holiday and its MORE important. You can follow in more detail progress on our house here.